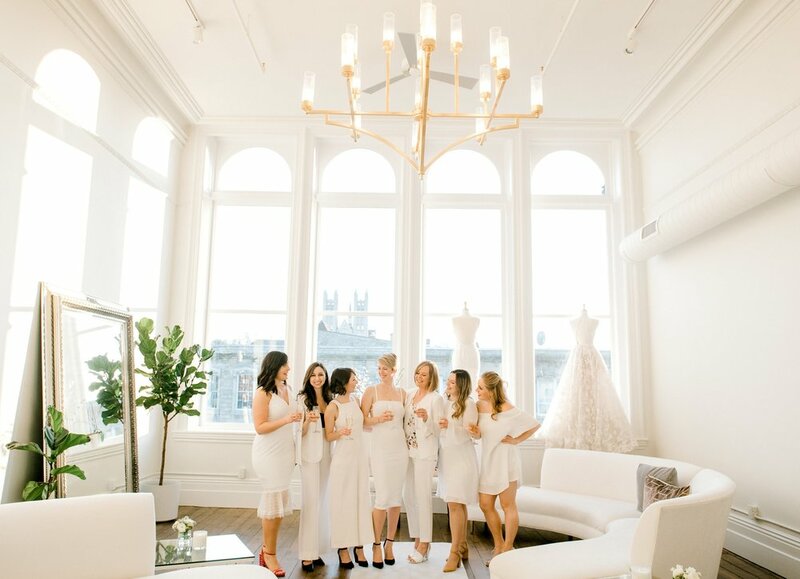 Our team at The Modern Bride has grown and we couldn’t be more excited! This is the perfect opportunity to introduce you to all the beautiful babes who make The Modern Bride so successful! Each week we will share some fun facts to highlight one of our #TMBTeam members. If you missed our last posts, learn more about our team here. Today, we are introducing you to our detail-oriented and accessory queen Boutique Curator, Alicia Gibson! Let’s start with fun facts about you! What are three things people would be surprised to learn about you, Alicia? Family is #1 for me, so I always make time for my husband James and our dog Sophie. I am a long-time watcher of acclaimed BBC series Coronation Street! I’ve been watching it since I was 8 and I am currently reading the 50-year saga to find out how it all began! I am a big foodie, so my honeymoon was planned around places to eat in Croatia, thanks to the help of Anthony Bourdain. Now onto the bridal questions! You’ve already tied the knot, but do you prefer a spring/summer/fall or winter wedding? I have always loved a spring wedding. I even planned my own wedding around the blossoming of the peony! If you were to renew your vows today, what TMB wedding dress would you pick to walk down the aisle in? Brigitte by Anais Anette! I love the floral lace, the modern cut along the side seam and that it's Canadian! What is your favourite part of a bridal appointment? My favourite part of the bridal appointment is the moment when the bride is standing in the change room in her favourite dress and she is smiling because she knows it's the one! You are the accessory queen, so it would only be fair to ask what is your favourite bridal accessory? I can’t choose just one, but my favourite look would be the Alyssa earrings from Joanna Bisley with the Julene hair pins from Olivia the Wolf, and the Delphine veil from Atelier Elise. I love our Canadian designers! So, it’s fair to say that you prefer veil over no veil? Veil all the way! Veils elevate the romance. Despite seeing the dress, what would you say if you favourite part of a wedding? Easy answer, the first kiss! Why do you love working at TMB? There are many reasons why I love working at TMB! I love being a part of a growing women-driven business and I love how we give back to the community I grew up in. I love the excited brides that come through our doors and I love hearing how we made the experience special for them and their family. I love the team we have established and I think that we all play such a vital role in making the business what it is today. Lastly, I love coming into work and seeing the amazing women that I work with. 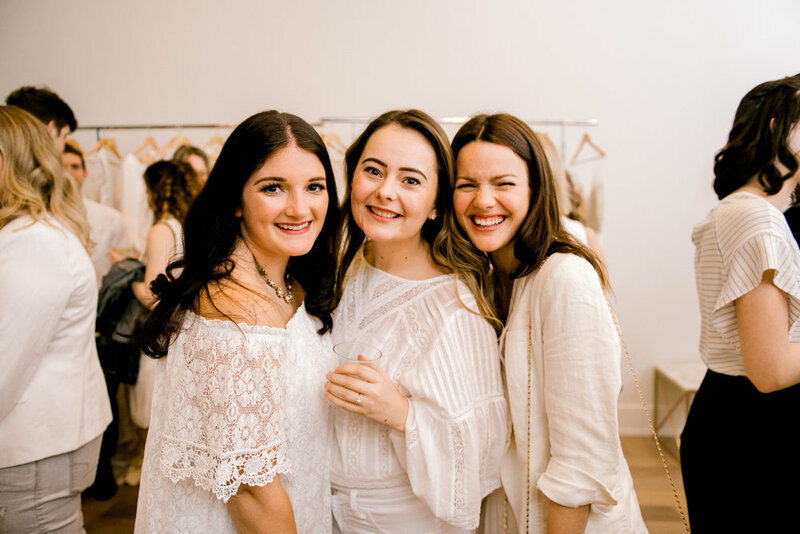 Our team at The Modern Bride has grown and we couldn’t be more excited! This is the perfect opportunity to introduce you to all the beautiful babes who make The Modern Bride so successful! Each week we will share some fun facts to highlight one of our #TMBTeam members. If you missed our last post about our boss-babe founder, Jessica Hirst visit the blog post here. 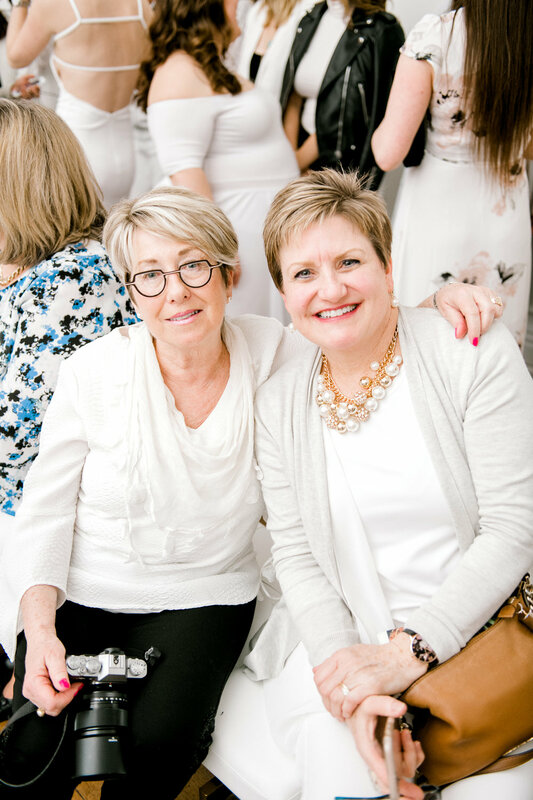 Today, we are introducing you to our interior-design-loving and bridal fashionista CFO Donna Hirst, who is responsible for making TMB look as beautiful as it does today! After all the amazing bridal appointments you’ve been involved with, what would you say is your favourite part of a bridal appointment? 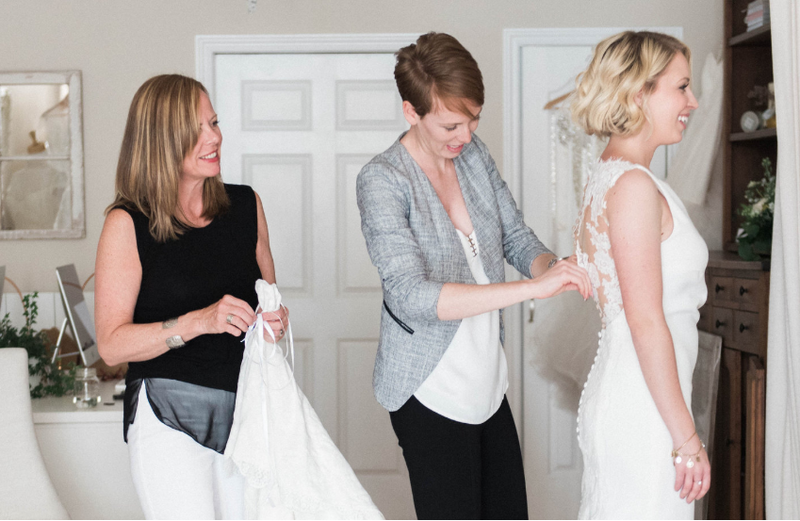 My favourite part of a bridal appointment is the first time we meet the bride and the people most important to her. It is the start of something magical! When you think of your ultimate dream wedding, is it in spring/summer/fall or winter? Summer and somewhere by the water! Are you on board with team veil or are you on team no veil? I’m going to have to side with team no veil on this one! Aside from seeing the beautiful dress the bride chose, what would you say if you favourite part of a wedding? Being around so many young, exceptionally talented women every day. Based on current bridal trends, what is your favourite trend modern brides are adopting? My favourite trend is not just specific to bridal fashion, it is that brides are creating their own traditions; no rules, doing it their way! To wrap things up, can you let us in on three things you think our TMB brides and followers would be surprised to learn about you? I practice yoga every morning and just started taking a barre class once a week. I love to garden. Working outside all day and getting my hands dirty is my idea of a great day off! I used to have my motorcycle license! 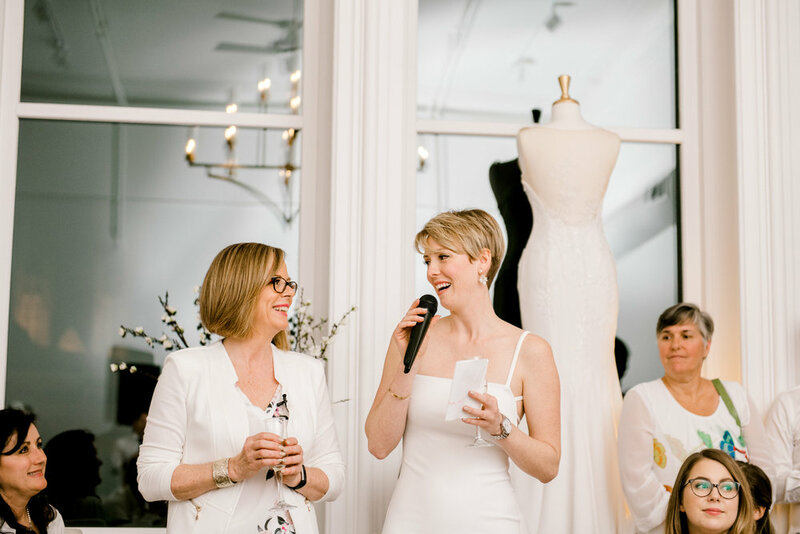 Bonus Donna fun-fact: Donna was the project manager responsible for helping transform our space at the Petrie Building to be the beautiful bridal oasis it is today! Thanks Donna! Our team at The Modern Bride has grown and we couldn’t be more excited! We decided this would be the perfect opportunity to introduce you to all the beautiful babes who make The Modern Bride so successful! Each week we will share some fun facts to highlight one of our #TMBTeam members; first up, we have our fierce and fearless, boss-babe founder, Jessica Hirst. Ok Jess, first things first, would you rather a spring/summer/fall or winter wedding? Such a hard choice; I always seem to have a chill so I’m partial to summer, BUT I have to say winter wedding, for the sleeves! If you got married today, what current TMB dress would you wear? Colonia - Atelier Pronovias! I love the neckline and sultry cutouts paired with the classic sleekness of the completely plain crepe. What is your opinion on the highly-debated bridal topic: Veil or No Veil? Veil! Always a veil! More specifically, a soft blusher and cathedral length veil. When are you ever going to get away with wearing a veil again?! Out of all the current wedding dress trends, what is your favourite? What is your absolute favourite part of a wedding? The first look! I have seen A LOT of weddings, but I have to say that the first look still gets me choked up. Also, any tears on the groom’s part absolutely slays me. Most important, why do you love working at TMB? TMB is something that I never imagined, but I can't imagine my life without it now! The women who currently make up TMB have truly (and almost literally) helped lay the foundation for who we are, and I am so proud. Each staff member who has joined us has become family and together I don't think there is anything that we can't accomplish. Corny, I know, but spend one appointment here and you’ll get it. These girls really make this place something to be proud of! Now for the fun of it, what are 3 things people may not know about you? 1. Pickles (or olives) would be my last meal, hands down. 2. I can pour a Guinness with a perfect shamrock on top. 3. I own about a million pairs of shoes, but spend most of the time barefoot.